Why is activated charcoal good for my health and my skin? By now you probably have heard about Charcoal being used in products such as skincare, deodorant or even toothpaste and it presumably seems a little bizarre to say the least. Charcoal on your skin – that black dirty powder? How could this possibly be beneficial to my health? Let’s begin with what it is exactly, so we can understand a little more about why it is so effective as an ingredient in skincare. First of all, it is not the same charcoal you use to BBQ with. Please don’t go using the ashes from your bbq in hopes for glowing skin or whiter teeth. That charcoal is full of chemicals and is toxic. Activated Charcoal is derived from Bamboo a sustainable natural resource. 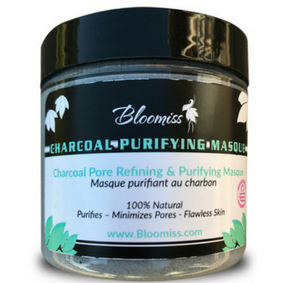 The charcoal we use in our skincare is Activated Bamboo Charcoal which is 100% natural and derived from Bamboo. A sustainable renewable resource that is environmentally friendly and can reproduce very quickly, bamboo is known to be a sign of ‘luck, in Asia and gold for skincare. Bamboo charcoal is processed by heating and steaming at extremely high temperatures which produce a powder. The charcoal becomes extremely absorbent and is magnetic for toxins and impurities which makes it so effective in skincare. Here are 6 reasons why charcoal can help your skin. 1. Detoxifies your skin by pulling out toxins, dirt and impurities from your skin leaving you with a smooth even complexion. 2. Deep cleans your pores. When pores are clogged with grease and oil your skin will look dull and lose its luster. 3. It can balance out your oily skin. When you use a product like a charcoal face mask, it will draw out the excess oil from your skin. 4. Binds toxins and chemicals to it, before they go into our body and bloodstream. 5. If you have Acne then you will want to use a charcoal product to clean up your skin. You can use a face mask as a spot treatment as well for breakouts. 6. Charcoal scrubs can be used as a gentle exfoliate to get rid of dead skin cells while pulling out dirt before it clogs pores improving your complexion. By adding activated charcoal to your beauty routine you will notice a difference in the appearance of your skin quickly. 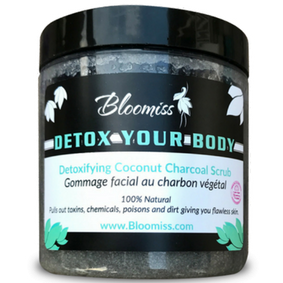 If you are ready to add activated charcoal to your daily routine we would love to offer you a special discount on our Detox Your Body Charcoal Scrub that can be used on your face and body as well as our Charcoal Purifying Masque of 25% off with code: Charcoal. Sharing exciting news with you, we will be launching a charcoal cleanser in the next few weeks that you can use the special discount code as well. Join our Blooming Circle for the update and be the first to know here. If you have any questions please don't hesitate to contact us at bloom@bloomiss.com.